Rob’s Flooring would like to help you make the right flooring choices for your home and lifestyle. We would also like to guide you through the process, introduce you to some different types of hardwood and show you how to care for your new floor. We would like to tell you all the things that a customer should know in order to make an informed decision about their hardwood flooring. This is a decision that will add warmth and beauty to any home and is without a doubt, a wise investment for every family. At Rob’s Flooring, we strive to supply quality hardwood flooring at competitive pricing. If you are as smart as you look, you have just chosen Rob’s Flooring to be your flooring contractor! At this time we will go over all the specifics of your job and you will pick the sheen of your floor: satin, semi-gloss or gloss. We do require a deposit of half down with the balance due on completion. Now you will set up a time to have your flooring done and you can be assured that we will arrive at your house when we are scheduled to be there. Then we start work on your project. Here is a short outline on the in home process. Any sub floor prep is done and your new hardwood floor is installed. Next you sand and coat the floor. Staining is done here also– after the sanding and before the coat. 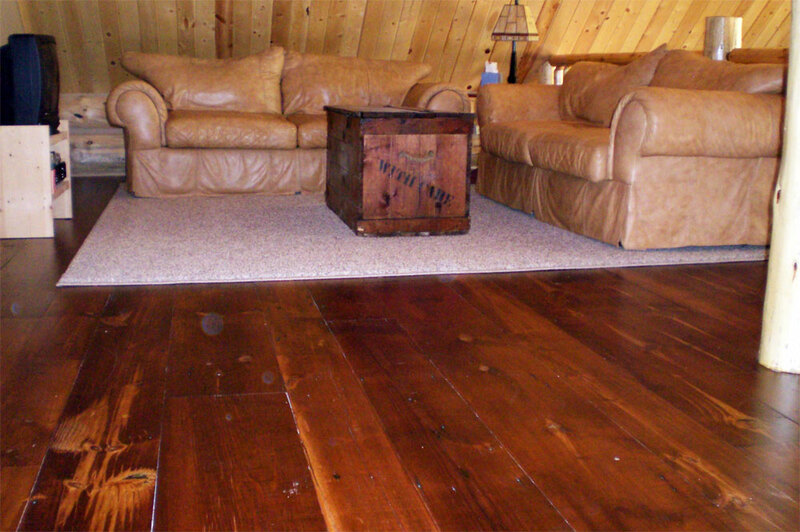 Staining will add an additional day to your flooring project. Another coat is applied on the last day and your floor is finished. You simply start with the sanding in this process. Stain if requested and then coating. A final coat is applied the next day and your floor is new again. A one-day process, the floor is buffed with a fine screen and a new coat of finish is applied. Remember there are many variables in this process, each floor is different and every job is unique. These are just brief descriptions to get you familiar with the process. Here are a couple of different options you have with your floor. Finishes: Oil based polyurethane- Has a warm amber hue to it and brings out the beautiful woodgrain patterns. Has a 24 hour dry time and has a strong odor. Water based sealer- Has a more clear patina to it. Has a much shorter dry time and less odor. Both finishes are available in different sheens. Satin is what we use on the majority of our floors. If you would like a semi-gloss or gloss finish, please inform us when scheduling. Staining: We carry basic stain colors in all our work trucks. If a specific color is needed, you can supply the stain, or we can arrange to get it for you. Vents: There are two types of vent, flush mount and drop in. Flush mount are level with the floor and drop in sit on top of the floor. This is a personal choice, both work equally well. Furniture: It is the customers responsibility to empty the rooms. If help is required, please inform us before we arrive at your house. If we are moving a hutch or cabinet, please have it empty. There is an additional charge for furniture moving. Appliances: We cannot remove or replace any appliances that have a gas or water line that has to be unhooked or hooked up. There is an additional charge for moving appliances.